Imagine a world where color was in limited supply. How would people view color? Could they still find beauty in a colorless world? Who would control the supply of color? Would it be an everyday occurrence? For our world building assignment we explored these questions by creating design fiction. As Bleecker outlined in “Design Fiction”, we used fiction and fact hand in hand by creating our own facts to describe what our colorless society would function like. While the pictures or newspaper article that we used were not entirely real in a sense, we made them real by adding a backstory which added to explaining our futuristic society. As the newspaper article so aptly describes, we pictured a world burdened by the after effects of nuclear fallout. In this world, color was all but lost and the earth was left only visible in various shades of grey. As technology grew, however, color was soon discovered and re-instigated into society; therefore, we wanted to be able to convey a rather foreign perspective on color. What if we never knew what red or green was? If we could never comprehended such colors, who’s to say the sky would need to be blue? In these various images, particularly the advertisements, we were able to explore a strange smattering of mismatched hues. To these people, color is cool just because it’s color. It wouldn’t necessarily matter to them whether or not it made sense. After all, if they don’t fully understand it, it could never truly make sense to them. Regardless, we decided that color would ultimately be a luxury and something only the rich could afford to produce. It’s similar to the ideas proposed in the 2011 film, “In Time” where time acts more as a currency than a force of nature. In the film, the rich hoard all the time in the world and are able to live as long as they so desire. Though our idea is much different in nature, those with access to color must needs be of high status. In the advertisements, COLOR is a brand with a restricted trademark, so the word “color” is literally owned by a company, and color itself is only understood artificially, as a product. To people who can only see manufactured or archeologically preserved color, places we recognize as beautiful, such as the wildflower fields in Oregon, the white cliffs of Dover, or Mt. Rainer might not compare in their eyes to a colored toothbrush or tube of toothpaste. In the second advertisement, while all the other photos depicting different aspects of life and nature are black-and-white and faded, the artificially colored tube of toothpaste and toothbrush are the bright focus of the advertisement, suggesting a rather tragic irony: That incredible Greek artwork, British castles, snuggling with a kitty, or stopping to smell the flowers, things that make life “colorful” in the sense that they enrich and enliven our experience, might pale in comparison to the sensation of adding actual color to a rather mundane product. For our Webspinna Battle, we decided to focus on a debate that seems to be pretty prevalent between college students: Mac vs. PC. Just like our reading in The Ecstasy of Influence, A Plagiarism, we not only didn’t avoid drawing upon those that have gone before us but in fact specifically sought out how other people have approached this topic. While some may see this as plagiarism, we wanted to have our characters and artistic choices recognizable so as to be able to build upon pre-established expectations. The main source of inspiration for our battle was the series of Mac vs. PC commercials that Apple released several years ago. In these, a chubbier man in a white shirt and tie represented PC while a simple, casual dressed man was Mac. These commercials made PC seem like a hopeless cross between businessman and nerd, just trying to win customers while Mac was chill and approachable. Drawing from this, we wanted to do something similar but something that would give a more balanced view of the two. So, we decided to emphasize how PC seems to be more popular with businesses and is often seen as more “traditional” while Mac is much more trendy and popular with students. We demonstrated this in both dress and audio. While we wanted the main source of the “arguments" to come from the audio, we realized it would be important to quickly and clearly establish what our personas were. 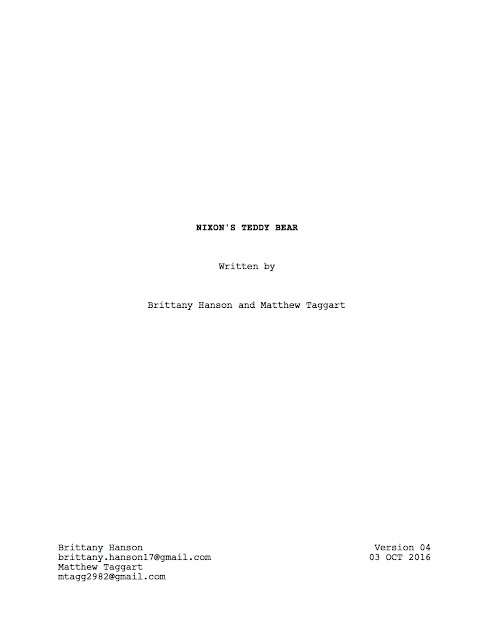 So to begin we used the start-up sounds for both the Mac (Brittany) and PC (Brendan). Brendan wore a suit to emphasize the classic-but-old-fashioned idea and Brittany dressed up in a slightly preppy but more modern nice-casual outfit. When Brendan turned around during the PC’s start-up sound, he revealed a Windows logo on his back, solidifying his persona visually and through audio simultaneously. During the PC’s next audio clip, “And loading,” the Mac booted up and immediately started playing “Better Faster Stronger” by Daft Punk, alluding to the Mac’s faster start-up speed. 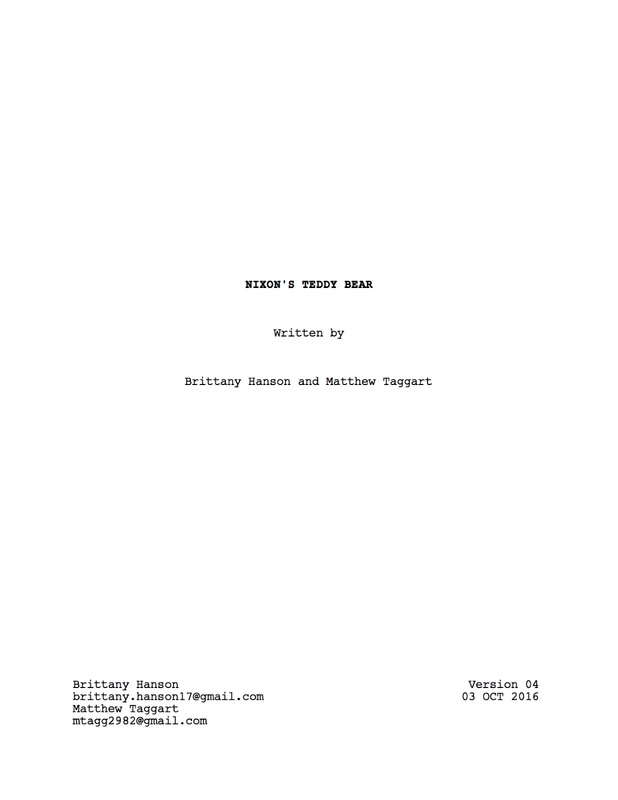 During that time, Brittany started dancing, turning around to reveal the Apple logo on her back. PC finally got his music going, playing the song “Classic”, when Mac interrupted with the song “Fancy”, arguing that while the PC is timeless, the Mac is “in the fast lane” (and perhaps a bit of a fad, as Brittany hopefully alluded to by taking a selfie). Next, the PC began a clip from Legally Blonde the Musical called “Serious”, in which he suggested that while a PC is the choice of computer for a professional, a Mac is just flashy; a bit of a Marilyn Monroe. PC also took a bite of Mac’s apple out of spite. The Mac responded with “Livin’ in the 21st Century” by Kanye West, emphasizing the Mac’s popularity and modernity. She then took her apple back and compared it to the logo on her screen, suggesting that whatever the PC does, the Mac will always find a way to compete. PC responded with “Better Than Me” and stole Kate (Brendan’s fiancée and Brittany’s roommate) from the audience to do the cha-cha to emphasize just how awesome traditional can be, even if the Mac thinks it’s better. Her fall was an accident, but one could argue it actually highlights the nature of computer error. As the PC grabbed a Windows hourglass-shaped battle ax, the Mac started playing a remix of Windows error noises (found on Youtube). The Mac, wielding a rainbow pinwheel of death error icon, was about to triumph when the PC started playing the Mac funk noise, and both of us started moving in jerky slow-motion as we “froze”, finishing off with a power-down noise. So who ultimately won? We both channeled some of the typical pros and cons of each computer through audio and visual resources, but we’ll let you decide. https://www.youtube.com/watch?v=nYG6QA9gF0o - Siri Shut Up! https://www.youtube.com/watch?v=Wx9XYrRpHjo - Better than Me! I was definitely more confident in the idea of this project than in the execution of it, “it” being the first clay creature thing I’ve made since middle school (Conclusion: Sculpting skills have not noticeably improved). Here’s the idea: Sculptures are generally made to look as if they are one uniform entity. Additionally, a clay sculpture of an animal usually doesn’t appear to be aware that it is a clay animal or to have any opinion regarding its state of existence. To challenge the first point, I decided to expose a common tactic sculptors utilize to cut down on the amount of clay necessary and to reduce the weight of the finished product. The body of my “clay” dragon mostly isn’t clay at all; it’s a ball of aluminum foil with a thin shell of Sculpey molded around it. Rather than disguising this “cheat,” I left half of the dragon’s body exposed so that the aluminum is visible. Just as Scott McCloud uses a comic to analyze the properties of a comic and the Daffy Duck cartoon draws attention to common elements of its medium by playing with the conventions of color, slapstick comedy, and varying depth of field, the exposed side of the clay dragon draws attention to the medium of sculpture itself and suggests that the finished product isn’t always what it externally seems to be. I left half of the dragon’s body exposed so that the aluminum is visible. The exposed side of the clay dragon draws attention to the medium of sculpture itself and suggests that the finished product isn’t always what it externally seems to be. The Daffy cartoon goes beyond simply exploring its medium. Daffy Duck’s character is aware that he is a cartoon, arguing with the artist and complaining about his salary. I wish I hadn’t spilled so much glitter all over the dragon so quickly, because my favorite part of my idea isn’t as clear as it could be. 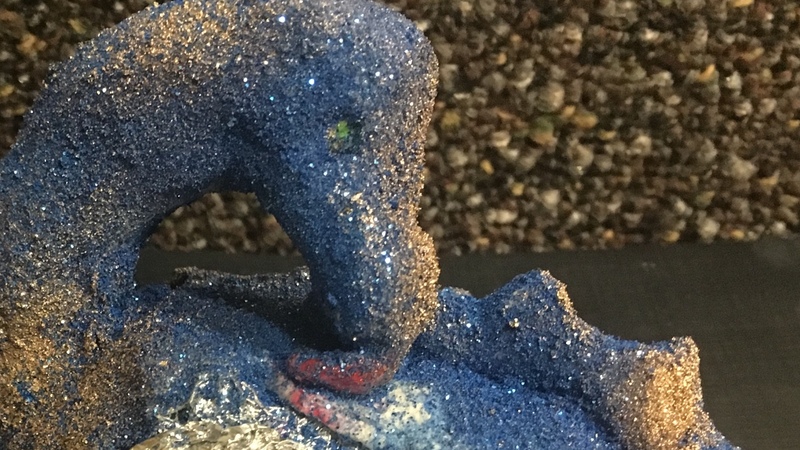 The dragon is supposed to be licking the glitter off of its back. The space around its tongue is a bit bare and its tongue is covered in its own scales. Maybe the dragon isn’t going to stop at just the glitter. Maybe it already peeled the clay off its left side and wishes it was just a ball of aluminum foil. Human artists aren’t always comfortable in their own skin, so it follows that not all pieces of artwork should be. 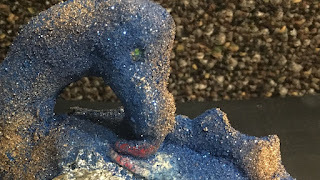 Dragon licking the glitter scales off its own back. Self-aware art is so interesting. I once saw a drawing of a girl sketching in her own eye, as if she was in the process of creating herself. The possible specific commentaries made by art that draws attention to its own creation are endless. I’d like to think that if a skilled sculptor took up my idea, that the finished product would make the viewer feel sad or thoughtful. I’d like to think that the dragon would be silently saying, “I don’t want to be me.” Or it could be begging the viewer to consider the heart beneath its exterior. There is more than one way you could interpret it. But of course, the art isn’t literally self-aware. Daffy’s arguments with the artist are still the creation of the artist, and the sketch of a girl didn’t actually draw itself. So the art is ultimately still a medium through which the artist is able to externalize an observation, an idea, or a piece of herself. With the latter purpose, perhaps self-aware art is the most thinly-veiled, most vulnerable form of self-expression. Maybe the person who drew the girl drawing her own eye is in the process of creating themselves. Maybe the sculptor of the dragon sometimes wishes she could peel away her exterior appearance, mannerisms, race, habits, gender and all of the attached expectations and just allow people to see the core of her personality, the endless aspects of herself that never make it to the surface. Wow, that’s vulnerability. It’s easier to make that point with a dragon, which, being clay and foil, is a tool that doesn’t mind being sculpted into any expression of its maker’s heart. Our historical story centers around the missing 18 ½ minutes of audio from the Watergate tapes that implicated President Richard Nixon. As far as we know, that audio was deleted from the only tapes it was recorded on. But what if a trace of those minutes still existed? What if the FBI would have found them were it not for a secret agent? And what if that agent was, of all people, Nixon’s maid? The 1970’s was a time of social questioning and exploration for America. Paradigms of government and war, music and fashion trends, and sexual norms and gender roles were all rapidly evolving, but it was only the beginning. Politics were, and largely still are, a man’s world. And for women who for whatever reason ventured into the workforce, there was no homelier or more traditionally feminine job than that of a maid. 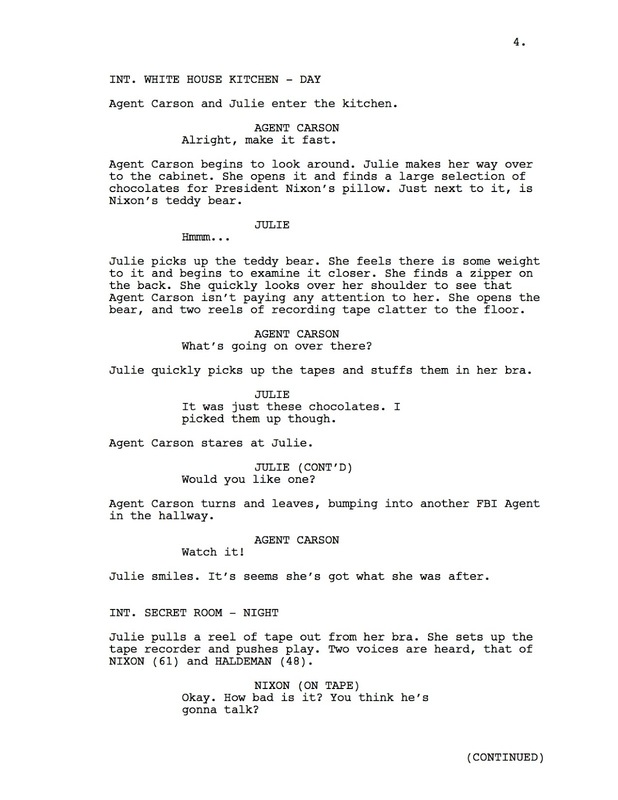 To a member of the FBI such as Agent Carson, a maid like Julie would already be unremarkable. So the idea that an older, unattractive maid with a naïve, servile attitude might actually be Nixon’s right-hand would sound impossible. We drew much of our historical source material from two documentaries, Our Nixon and an episode from The Seventies called “The United States vs. Richard Nixon.” The TV broadcaster’s dialogue is taken word-for-word from an actual report given in the 70’s. Haldeman was Nixon’s Chief of Staff. The basic facts of the Watergate case of course informed the character’s actions and our central “What-if”, but the unspoken yet prevalent social structures presented in the documentaries were influential as well. It is difficult to disregard the lack of women playing influential political and legal roles in the films. Of the few women who give their opinion of Nixon, several reply much more demurely or less articulately than their male counterparts. Such observations don’t prove that women in the 70’s were unintelligent or unimportant in politics, but they do reflect gender norms of the time, and as mentioned, we played off of these norms to create Julie’s unassuming façade. As all women know, sometimes it’s easier to play sexism to one’s advantage rather than attempt to overcome hundreds of years of gender norms. 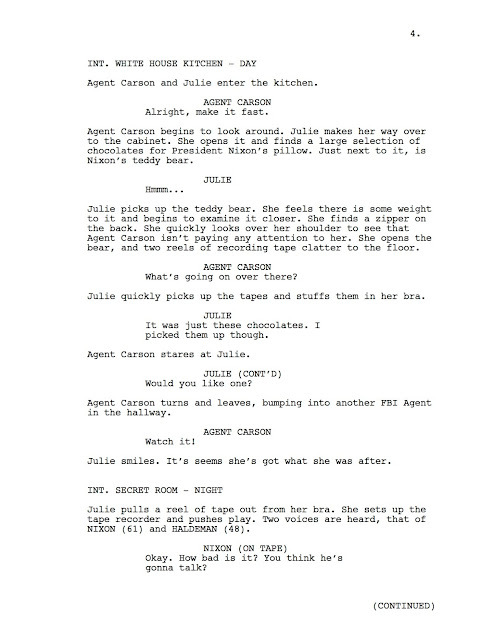 With her collection of weapons and espionage devices, we implied that Julie has been in the secret agent business for years without getting caught, so she must be pretty smart. But she uses her older age and below-average looks, playing the part of a naïve maid to fly under the radar of the FBI. 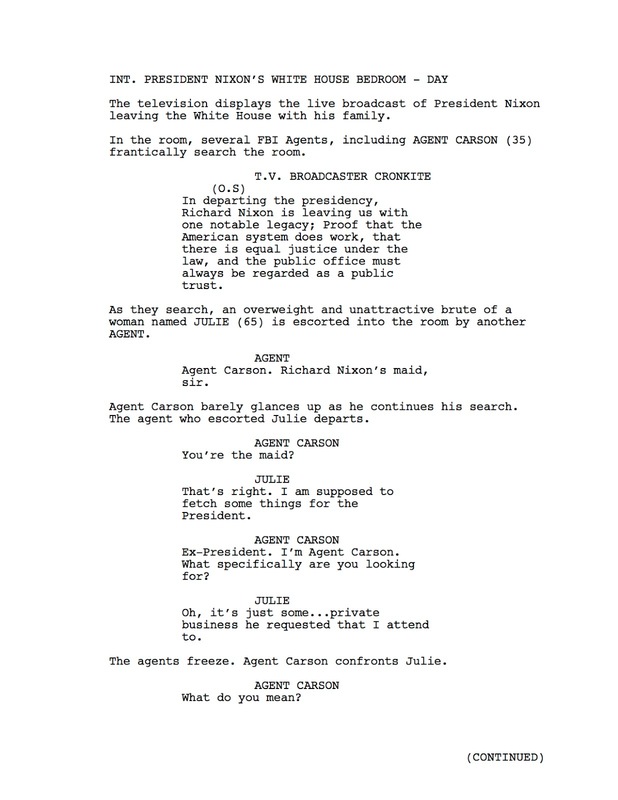 Carson and his fellow agents are openly condescending throughout the script. It’s no surprise: They’re younger, they’re “highly trained” professionals, and they’re men. 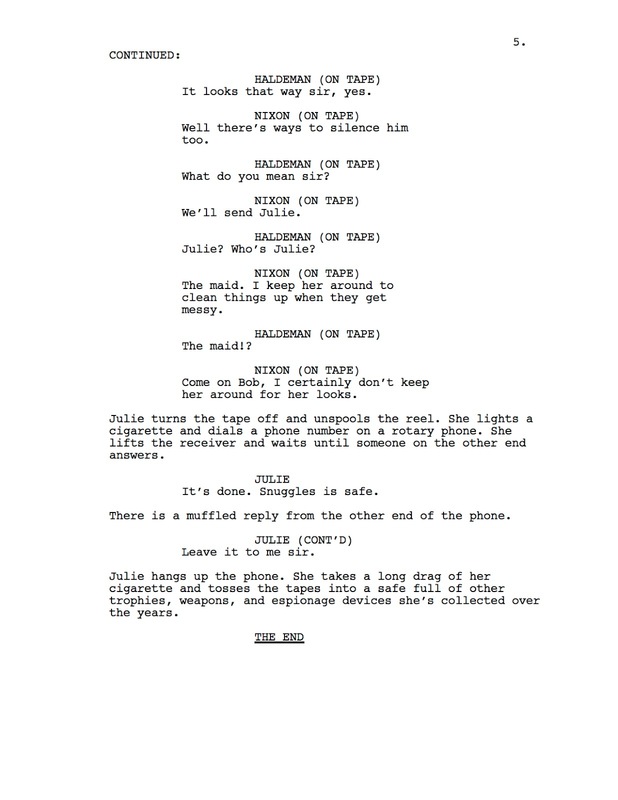 In other words, the male agents rest comfortably in social sphere far above Julie. 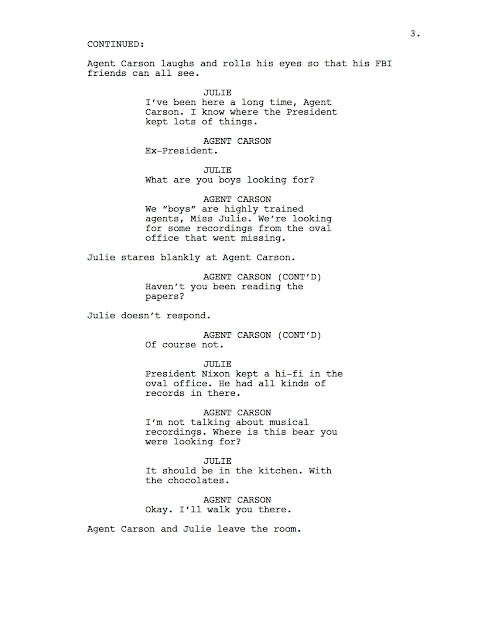 Nixon of course buys into the idea that Julie is not what she appears to be when he jokes, “I certainly don’t keep her around for her looks.” But with this comment, even Nixon, who clearly trusts Julie’s intelligence and competence, readily objectifies her although a maid’s physical appearance has nothing to do with her ability to clean. Sexism was complicated in the 70’s and it still is today. 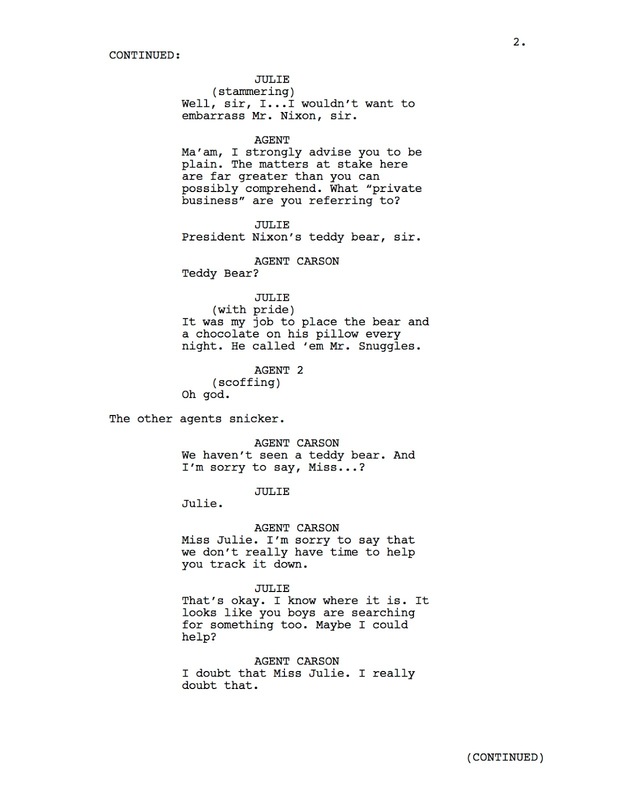 Maybe someday people won’t have to (or be able to) hide behind the stereotypes of their gender, race, sexuality, or religion in order to accomplish something remarkable, but until then, this script is our tribute to the “Julies” of the world. A quick connection to the class reading: The antagonist of our story, Agent Carson, might be a bit black-and-white, but like Persepolis, the depiction of the scenario in our script is partially a commentary on gender issues. While oversimplification can become problematic, whether in the blocking of two opposing groups on opposite sides of a cell in a comic, or in the condescending characterization of an FBI agent in a script, when done effectively, it’s useful shorthand. 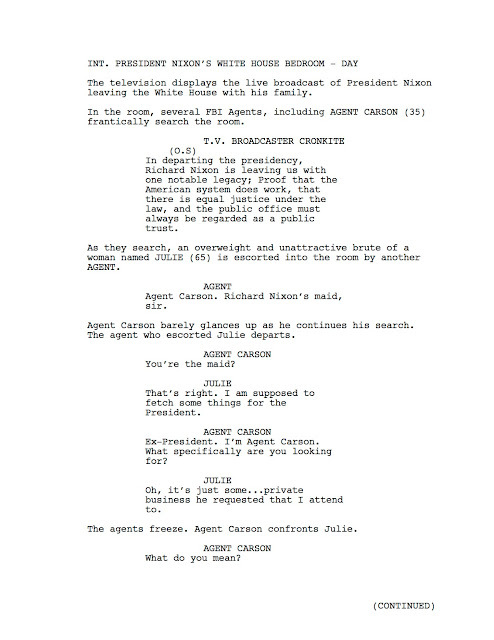 Hopefully Agent Carson isn’t painfully one-sided. We’re sure he has a nice family back home, and we admit that it probably isn’t easy to remain polite under the stress of his job.